Northam’s total collapse to the whims of Virginia Governor Terry McAuliffe’s (D) presidential ambitions – he reversed his previous position and called for the removal of all Confederate statues and monuments in Virginia – is a potential death knell blow to a listless campaign that is focused on running out the clock. McAuliffe, who will run for President in 2020, wants to be the Nikki Haley of the Democratic Party. Haley, the former Republican governor of South Carolina, called for the removal of the Confederate battle flag that flew over her state’s Columbia capitol for over 150 years in the wake of the Dylan Roof Charleston Church massacre. Haley’s steadfast position burst her onto the national scene. She is now U.N. Ambassador. Enter Terry McAuliffe, stage Left: Renaissance man. McAuliffe wants to go to Iowa and New Hampshire as the epitome of a new and revitalized Democratic Party: a record of jobs creation and economic revival in a southern state and the first governor of Virginia – of all places – to call for the removal of all confederate statues and monuments. So, the Virginia Governor, seizing on a political opportunity for 2020, called Richmond Mayor Levar Stoney – who owes his job to McAuliffe – and told him to reverse his position on Confederate monuments in Richmond. Like a good soldier, Stoney promptly capitulated. That left Northam in no man’s land. He aptly followed suit, and called for all Confederate statues and monuments to be removed from Virginia. While this is a brilliant strategy for McAuliffe’s Presidential ambitions, it’s a disaster for Northam’s gubernatorial race. 62 percent of Americans believe statues honoring leaders of the Confederacy should remain as historic symbols. By a 44 to 40 percent margin, African Americans said statues honoring leaders of the Confederacy should remain as historic symbols. 65 percent of Latinos said statues honoring leaders of the Confederacy should remain as historic symbols. The fact is, many people believe forces of the far left and political elites in Richmond and Washington are trying to enforce their political agenda on the American people and erase statues of historical and cultural significance that they disagree with. To many average Americans of all ideological stripes, it feels Orwellian and Soviet-esque. Exasperating the matter is the fact that many on the left chased this issue down the proverbial rabbit hole, and as usual, have taken it to an extreme. New York Mayor Bill de Blasio is calling for a review of “all symbols of hate,” leaving open what symbols might actually be removed. A pastor in Chicago wants a park that is currently named after George Washington and Andrew Jackson renamed and a statue of Washington removed. Minority Leader Nancy Pelosi is pushing for Confederate statues to be removed from the Capitol building. At multiple universities across the country, students have called for the removal of Thomas Jefferson statues. Georgia Democractic candidate for governor Stacey Abrams wants to whitewash Confederate Stone Mountain carving. ESPN 3 bounced a sports caster from calling a UVA football game because his name is “Robert Lee.” He’s a second generation Asian American who’s parents emigrated from Korea. It is inexcusable that some people have decided to take action into their own hands, vandalizing statues that they disagree with, like we just saw in Baltimore with the Christopher Columbus statue. In Chicago, a statue of President Lincoln was beheaded and the Lincoln Memorial in Washington was vandalized just days after Charlottesville. Most analysts say the Republican candidate for governor can’t win in Virginia in 2017 based on historical trends and shifting demographics. Approximately 2.2 -2.4 million Virginians will vote in November. 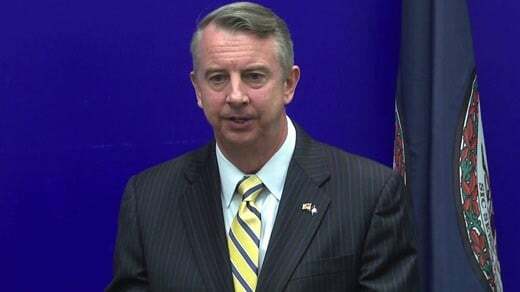 Gillespie needs 1.1-1.2 million votes to win. 1.7 million Virginians voted for Trump in 2016. So Gillespie needs about 65 percent of Trumps’ turnout to show up on Election Day to win. While his campaign is not overly inspiring to the Trump core base, the statue removal position of Northam is now a boomerang. Once again, the Democrats overplayed their hand. They are aggravating average voters, who don’t like to be called racist just because they are opposed to having the nation’s history erased. In 2013, McAuliffe defeated GOP candidate for governor, Ken Cuccinelli, by a mere 2 percentage points. This was in the face of a government shutdown (not happening in 2017) and no money from the Republican National Committee or Republican Governor’s Association at the end of the campaign. I now rate Gillespie the favorite. Well, John, I actually agree with you. Wonders never cease! There’s a first time for everything Alice! “They are aggravating average voters, who don’t like to be called racist just because they are opposed to having the nation’s history erased.” Well done, John. I sure hope you are correct about the election. I love Virginia and our history. It is not all rosy but it belongs to us the citizens and visitors who come to tour our beautiful state and it’s rich history. History should be told and seen exactly as it happened. The Good and Bad. We only know how far we have gone if we know where we started. And we have come a long way.